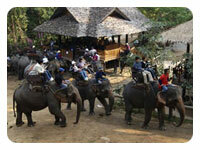 A pleasant scenic trip to the north of Chiangmai. 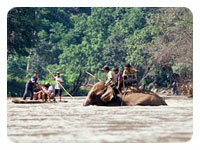 Amidst lush tropical jungle beside a meandering river, watch elephants take their daily bath. ( OK guys, blow your trumpet and clean those nostrils ). A show of how these magnificent animals are used in the timber industry.…pushing, dragging and rolling logs in unison at the command of their mahouts. And here comes the best part…”ride ‘em cowboy” time. 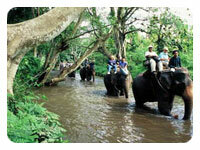 It’s now time for an exciting 1 hour elephant ride over the hills and into the lush jungle. You’ve got to “swing with the sway” as you rumble and thrash along…and hang on tight folks. (Elephants are very sure-footed animals). Then experience a 15 minutes ox-cart ride back to the camp. (This form of transportation is probably similar to what your ancestors traveled in, in the Middle Ages). A picnic lunch is provided under the cool jungle shade. 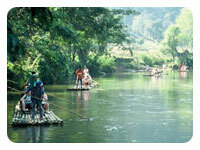 After lunch, enjoy a 1 hour “Huckleberry Finn” bamboo rafting trip on the placid Mae Taeng river. Glide along in a summer dream. Visit an Orchid Nursery Farm filled with exotic orchid blooms. A superb butterfly collection is also available for your perusal at a Butterfly Farm. Return to Chiangmai.